Colors, images, logos, avatars, icons, buttons, links, titles, descriptions, intros, features, toggles, sizes, shapes, fonts… if you can see it then you can customize it! Go Big is designed for you to make it your own and show off your individual style. You can customize almost everything you see via the options in your Customize panel, no coding necessary. 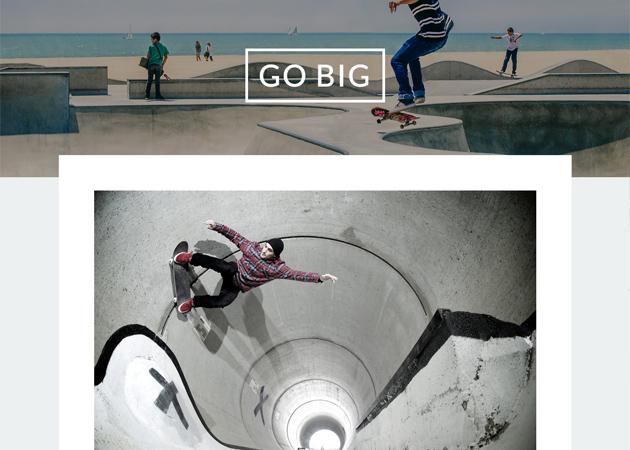 The header on Go Big is truly awesome. Add up to 5 images to be randomly loaded on each page load. 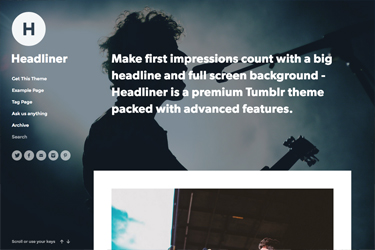 You can adjust the percentage header height for the home page and posts/pages separately, and choose a subtle parallax scrolling background effect, or standard scroll. You can also pick an overlay color and opacity to help with readability. 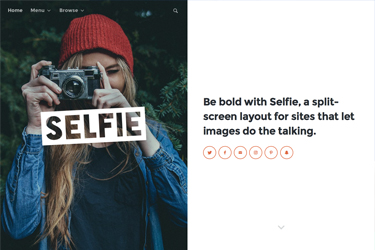 Upload your own logo or avatar, or use the built-in logo. 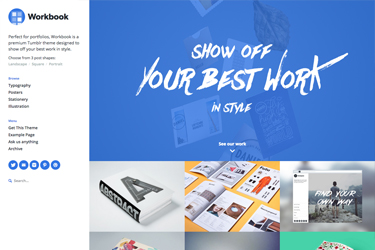 You can customize the title font, size, spacing and border to get your style just right. 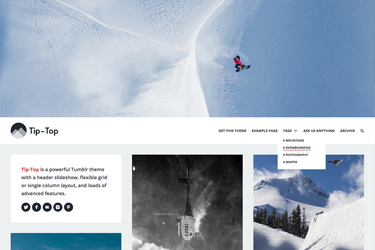 There’s even an optional ‘scroll down’ message to direct your visitors down to your posts. 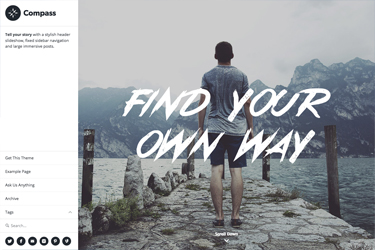 Go Big’s menu allows your visitors to search your blog, navigate your pages and find your social networks, all in one place. There’s a drop-down 'tag menu’ to help organise your content - show links to just the tags you want. You can also choose to 'fix’ the menu to top of the screen as you scroll down, so it’s always their to guide your visitors. Go Big features two layout modes. 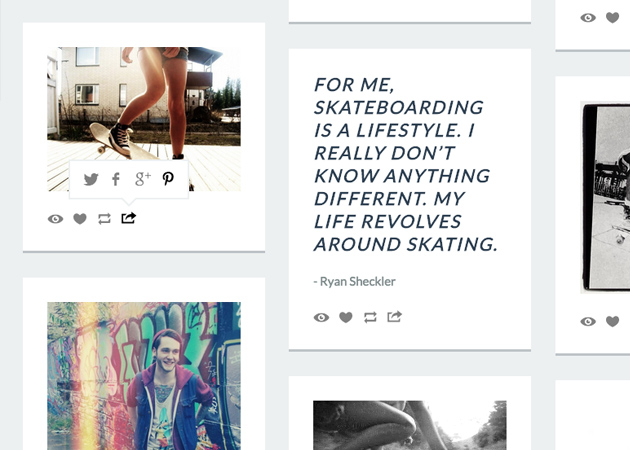 The default fully fluid/responsive grid allows you to show lots of posts at once in a great dynamic layout. 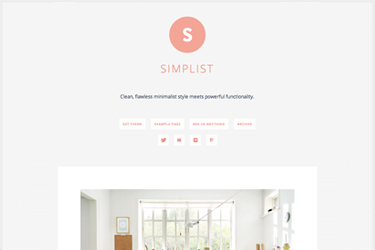 You can customize the grid spacing to best suit your style. 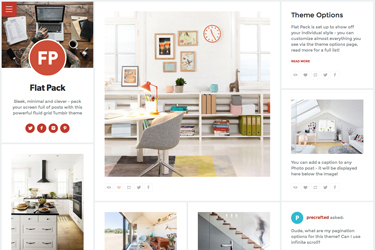 Alternatively, choose the single column layout for a more structured layout with larger posts - you can also control the width of the single column. 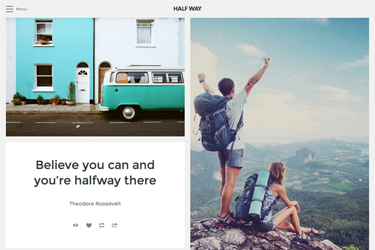 We’ve built in a special tag - double_size - that doubles the width of your post in the grid layout so it takes up two columns. Just tag it in the post editor, and Go Big does the rest. Perfect for those extra-special posts! When it comes to loading more posts, you have three choices - a sleek 'load more’ button, infinite scroll, or standard 'previous/next’ pagination. 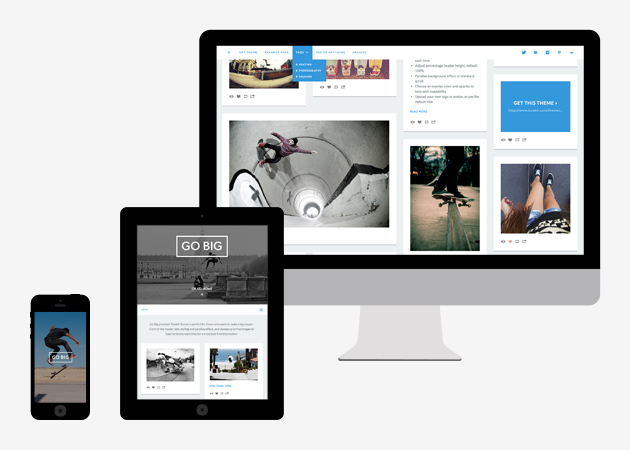 Go Big’s layout adapts to fill your whole screen with posts - from the smallest mobile or tablet to the largest cinema display… resize your browser and see for yourself! 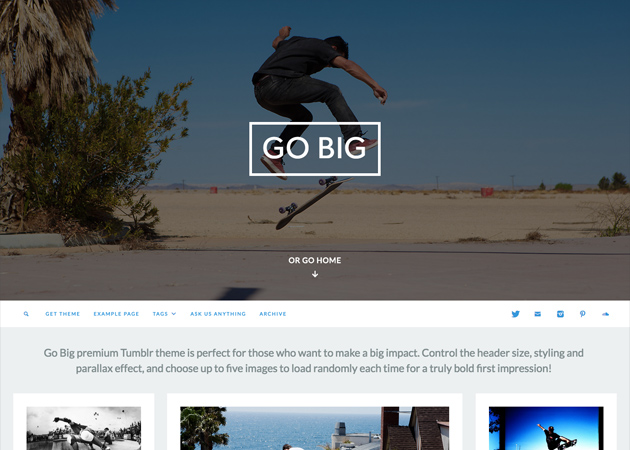 Go Big is designed to display all of Tumblr’s post types. 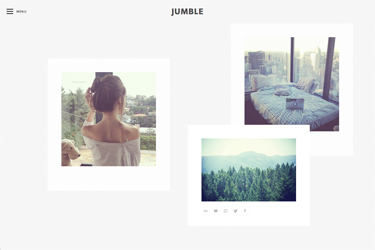 No matter what type of content you want to publish on your blog, the theme will display it beautifully. Take full control over your photos, panoramas and photo set grid posts with lots of built-in options for photographers and portfolios. 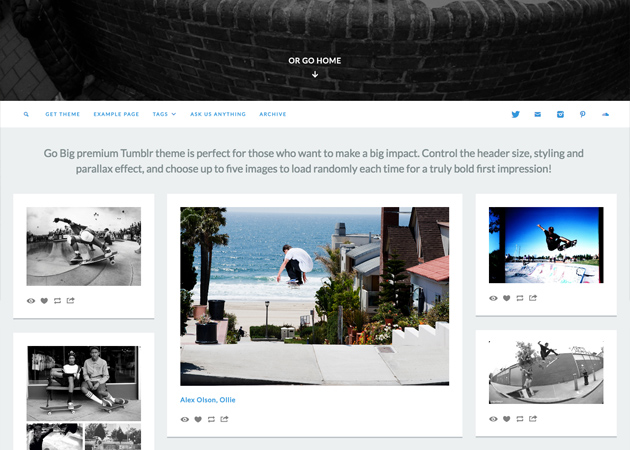 Go Big fully supports custom Photoset layouts - the layout you create in the Tumblr post editor is the one you see on your blog! Choose what happens when you click any image type - link to the post, to the image, no link or open a lightbox. 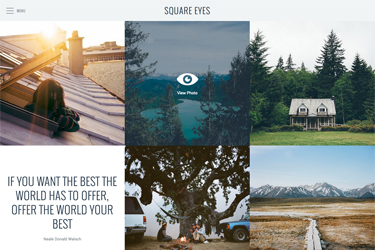 Choose your photo set grid spacing, and even use the first image in your photo set as a 'cover’ on the home page. Just add the full URL to your profiles (e.g. http://twitter.com/precrafted ) to activate the built-in social media icons for Twitter, Facebook, Tumblr, Website, Google, Linkedin, Foursquare, Skype, Email, Instagram, Flickr, 500px, VSCO Grid, Camera, Eye, Pinterest, Heart, Youtube, Vimeo, Vine, Ebay, Store, Apple, Googleplay, Etsy, Dribbble, Behance, deviantART, Github, Medium, Quora, Weibo, Travel, Lastfm, Rdio, Spotify, Soundcloud, and RSS. 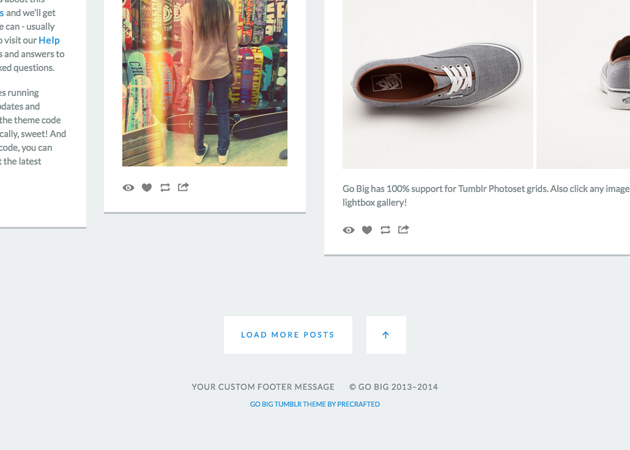 Go Big also features a neat social sharing widget in the footer of each post - allow your visitors to quickly and easily like, re-blog, and share your posts on Twitter, Facebook, Google and Pinterest… you can even turn each network on or off. For advanced users, we’ve built in support for embedding web fonts from services like TypeKit, Fonts.com and Google Fonts. You can paste in your embed code and name your fonts for the main type elements. Read more about this feature here. 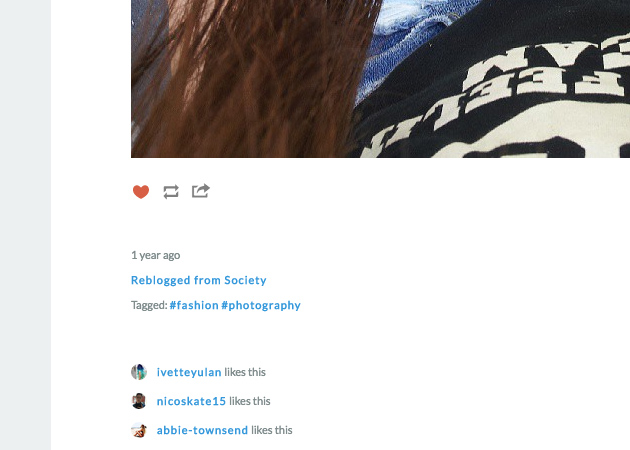 Once your visitors are on an individual post page, they can use simple previous/next post buttons to keep browsing through your posts without going back to the home page - a great to keep them immersed in your blog! If you want to enable comments on your blog, just sign up for an account with Disqus, and once you’re all set up just paste your Disqus Shortname in to the theme options. Support for Google Analytics tracking is built in and ready to go. Just create a new property for your blog in your Google Analytics account, and then paste the Property ID in to the theme options. 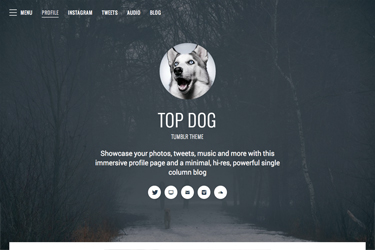 Support for group blogs is built in - if you run a group blog, you can choose to show the author’s avatar and name at the bottom of the posts that they create. If you have any questions about this theme then just email us and we’ll get back to you as soon as we can - usually the same day. We take pride in our excellent customer service, and no email goes un-answered! You can also visit our Help Center for tutorials, tips and answers to your most frequently asked questions. 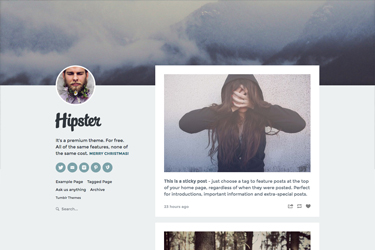 We keep all of our themes running perfectly with regular updates, tweaks and new features. If you don’t edit the theme code you’ll get them automatically, sweet! And if you do edit the theme code, you can reset it at any time to get the latest version. 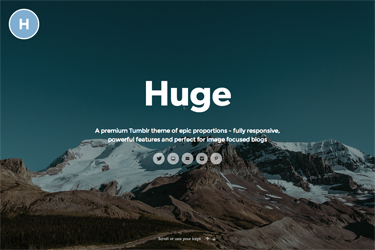 Need to customize Go Big beyond what’s possible in the theme options, to make it fit better with your brand, or change some of the functionality? 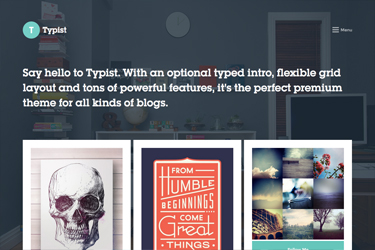 We’ve partnered with Tweaky who offer small design and development tweaks for any website, including Tumblr. 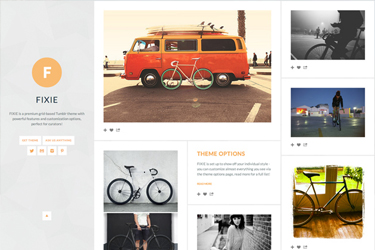 Use PRECRAFTED as your coupon code for 25% off any tweaks to our themes!